In my previous post, I summarized what I think we know about this ecological whodunit. In this post, I look at what it might mean for landowners in the area. We seem poised for another stressful summer. May 2018 has turned out to be one of the driest on record, and we are unlikely to catch up in June. Long term forecasts are for another warm dry summer. We will just have to wait and see how it unfolds. But whatever happens this summer, I think we can expect to continue to see more sick, dying and dead trees. There are several reasons for this. First, many trees are already stressed or injured by the past hot drought events and are in a vulnerable condition. While not yet lost, this stress makes them less resistant and more susceptible to the insects and diseases that are lurking about. A mild summer, or several mild summers would help. But even then they will not recover immediately. Their earlier stress and injuries also hamper their ability to recover and rebuild their resistance, even under good conditions. An analogy might be of me falling off a ladder. The injuries I suffered when I hit the ground continued to affect my health and recovery long after I stopped falling (it is harder to exercise with a broken leg). It will take a while to recover, even if I stay out of trouble. It will take longer (or could kill me) if I keep falling off the ladder. For the trees, each of these summers is like another fall from my ladder. Many of our readers have been tracking this issue over the last several years through the articles on this site. But I imagine many of you are wondering what to expect next, or are being asked by friends and neighbors who are concerned about your trees or theirs. Or just wondering what is going on. What to say? So, here is a synopsis of what I generally see going on, and the consequences. A bit risky to do, given the role of individual sites and specific conditions. But this is such a widespread phenomenon, it warrants some interpretation, even at the risk of over-generalizing. But I provide the antidote at the end: links to more detailed information. It is hard to miss all the dead and dying trees in the area. I have been getting dozens of calls about them. So what is going on, and what is to blame? 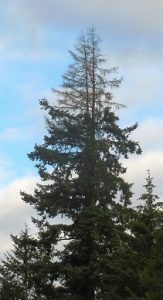 It seems time to revisit this sylvan whodunit: What is killing all these Willamette Valley trees? 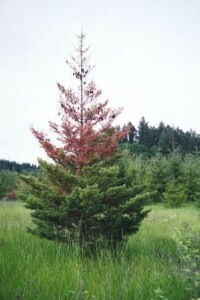 Drought symptoms may include dead branches, dead tops and low vigor. Or all of the above. Photo by Dave Shaw, OSU Forestry & Natural Resources Extension. hardwoods as well as conifers, both native and non-native. Many of the usual suspects – different beetles and fungi- can be found at the scene too. What is happening? 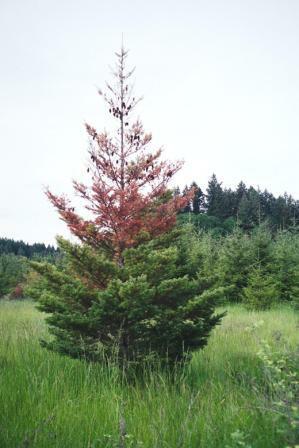 Symptoms often include dying branches and dead tops, low growth and vigor, sparse crowns, what we have called the “Willamette Valley crud”. It is now often progressing to the death of the tree. This may be happening to individual trees or groups of trees. The younger trees are usually the first involved at a site, eventually joined by older trees. Conifer trees around the Valley continue to show signs of severe drought and heat stress this year. This should not be news to many readers: young dead trees are now a common sight throughout the Valley. 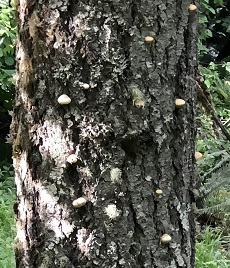 Also, I wrote about this problem in past Tree Topics blogs (See stories from May and September 2015 for background) but have new updates for this season. The phone has been ringing off the hook lately with calls from people describing sick and dying Douglas-fir and other conifer trees. The trees are of a wide range of ages and in many environments and settings, although most calls have been coming from within the valley margin and have to do with young trees. So far, the answer is generally: “It is drought stress”. Huh, in May? Well it has been a dry winter and spring, … but that is not the issue. My best explanation is that we had a pretty hard end of summer last year. Remember that? NO rain until mid-October then, Boom, it was winter. 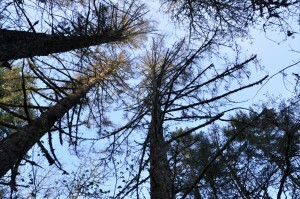 By then, many trees had started running out of water, killing tops or branches, and leaving leaders and branches susceptible to attack by various opportunistic pests. We started seeing a few classic signs of drought stress (tops dying and branches “flaring out”) at the very end of the season last year, but late enough that many did not have time to show up before the weather turned. Injuries had occurred, so it was just a matter of time before they expressed themselves, which is happening now. The recent hot weather seems to have made it more sudden and dramatic. This happens from time to time. 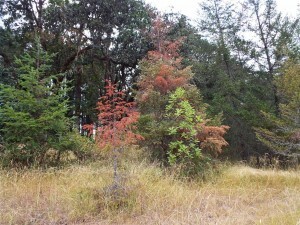 Here are two good articles a few years back by the ODF Forest Health team explaining Dead tops and Branches (with Good pictures), and about Drought and Mortality. It is important to keep in mind that the Willamette Valley can be a challenging climate for trees. 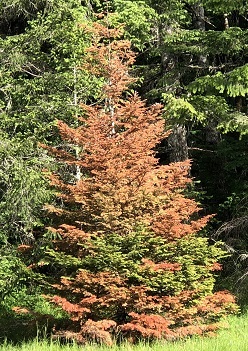 Many of our soils in the valley are poorly drained, which is hard on most of our conifers, and other soils are fairly shallow and cannot hold much water. Also our summers are hotter and drier than in the mountains. 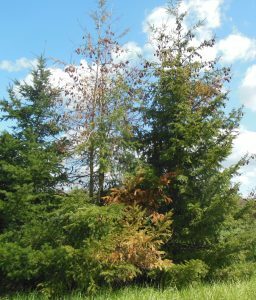 Heat and drought stress can kill trees outright, or more often just put the trees under stress, which can then lead to pest problems (as explained in the two publications above). From what I am seeing and hearing, the major cause of the problem now seems to be drought stress. 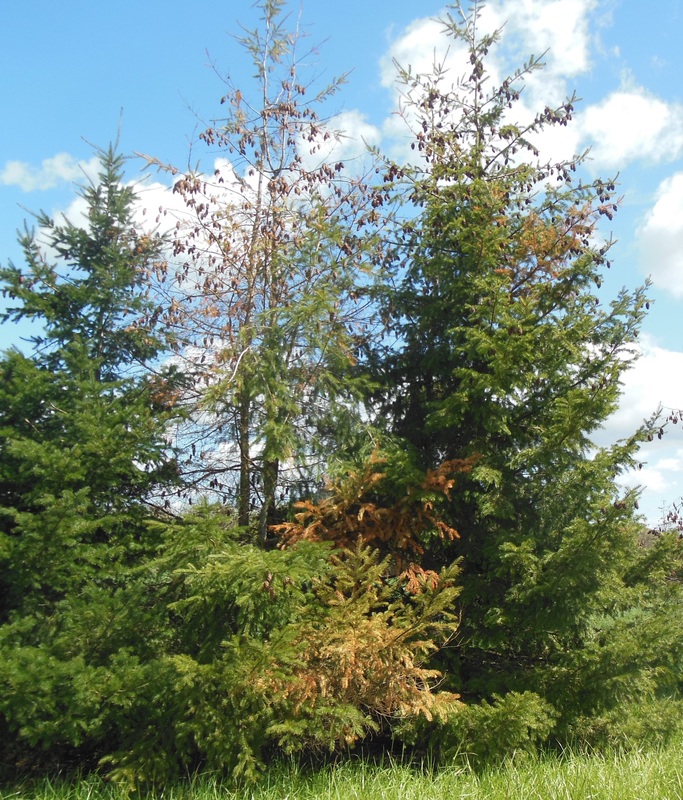 Insect or diseases which able to take advantage of a stressed tree’s condition may sometimes be involved, but they are generally not the cause of the problems. Finally, weather can be more stressful when trees are overcrowded, so thinning stands to keep trees vigorous with adequate growing space may be helpful in the long term. Right now, we just have to wait it out, and hope we get some serious rain this year, or we will see this problem intensify. We all better get out there and wash the car…..